Is your audience’s mind ‘wandering’? Here are 42 ways to keep their attention. This month, I’m focusing on training. Why? Because you’re hiring good potential, but you need a plan to develop that potential. And, that development comes through training and coaching. Trainers: Do they snooze when youa��re in front of them? Do their eyes slowly closea��and then blink open when theya��re startled by something you do in the classroom? Do you feel frustrated when you cana��t keep their attention? The solution is simple: Gain more teaching skills. Sounds easy, doesna��t it? But, the most difficult thing for us adults to do is to gain new skills. Instead, we tend to try to purchase competency (invest in software, programs, and a�?thingsa�� that supposedly do the work for us). But, in this case, all the PowerPoints in the world cana��t overcome a boring presenter! Did you work to put yourself through college? I did. I found out it was much easier to put my talent to work and get paid, than to pick beans! So, when I was nineteen, I got a job playing piano in a bar. (Boy, did I learn about human nature). When I was tickling the ivories, playing my way through college and graduate school, I noticed that, the more tunesa��and styles–I mastered, (that’s the repertoire), the more tips I made. I could please more of the people more of the time. Ita��s the same way with teaching, or doing keynotes, or presentations, or facilitation. The more skills you hone, the easier it is to be effective in front of people. So, we try to talk better. But, then, we hit our a�?ceiling of achievementa��. We cana��t seem to get any better. Then, we get frustrated. We try harder. That doesna��t help. Sometimes we look for someone who can help us a�?talk bettera��. We take a class thinking that someone will make us titillating on the stage. The interesting thing is thata��ita��s not the answer for most of us. How good are you at these teaching methods? 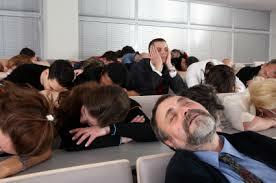 Do you tend to rely on the good old stand-by, lecture? A�If so, youa��re boring your audiences to death! I teach Instructor Development Workshop in the state of Washington. This fulfills a requirement for instructors to teach clock-hour approved courses in the state. So many times, people come into the class wanting me to a�?fix thema�� so they will be fascinating in front of people. What I have to do is to teach them all those other methods to teach effectivelya��skills they can learn and master. Ita��s interesting to watch their paradigms switch from a�?make me another Johnny Carson or Don Ricklesa�? to a�?Ia��m grasping great teaching methods that work for me.a�? To see my upcoming courses, click here. One of the things I do in Instructor Development is to demonstrate to students many teaching methods. Then, we a�?take it aparta�� and talk about how they would apply these methods to their own situations. Ia��ve developed a list of 42 Teaching Methods to summarize the course. Click here to get it. 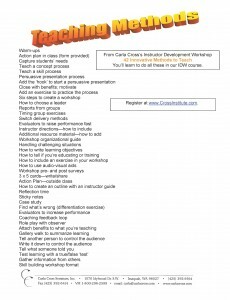 Want me to come toA� your company or association and teach these methods? Ia��ll customize the subject matter to match what you need. I believe training is major answer to our industrya��s offering value for services, and I can help you create great trainers and effective training. Click here to contact me, and wea��ll talk about your needs.